Want to follow all the Holiday Retail Fun? Check out the GrabPERF Black Friday Dashboard! Follow the Web performance of your favorite retailer all the time! New and updated for 2008! This morning, Tiger Direct effectively imploded. UPDATE: Looks like they found the solution to their problem. Sears measurement data for the last 8 hours can be found here. 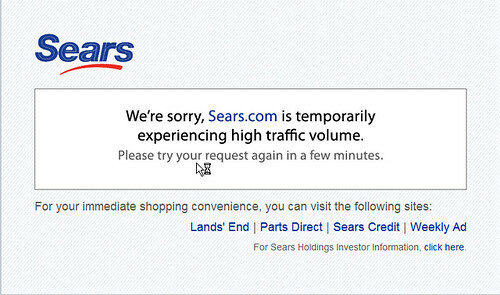 UPDATE: It gets worse for Sears. 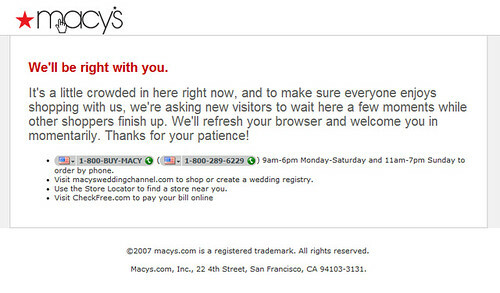 Look ma: Macy’s is already too busy. Yeah. Let the fun begin. Ok, for my birthday (November 14), I am going to Columbus, OH. mon.itor.us, a service which also provides free Web performance measurement services, appears to be having a wee problem. The most recent GrabPERF data on this site is available here. The issue may be corrected by the time you look at the data. I don’t wish suffering like this on anyone. 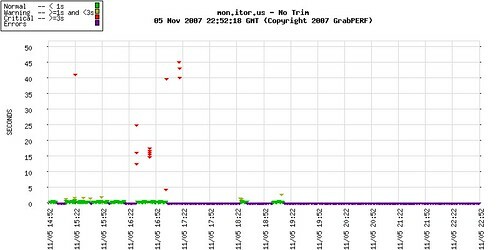 GrabPERF had it’s own 3-4 day outage a few months ago. It’s just sad to see when monitoring services go down. Larry. To hell with them all. Elect Larry. I am a sucker for dogs. It’s pretty much a global statement. Ok, excluding genetic freaks that appear on the arms of Paris Hilton and ladies who lunch. However, the rule is: the goofier the dog, the better. Samantha and I use the laugh factor when selecting our dogs. If we see the dog, and it makes us laugh, we take it. That’s how we ended up with Wiggles, the Damnation Hound (Half Basset, Half Dalmatian). Well, I have met my Dream Dog. Meet Larry. You can see a LOT more of Larry here. Part of the problem with making a lot of East to West trips across the US is that the flights back are a nightmare for timing. You either lose most of a day or have to take a red-eye. Well, taking the red-eye has only one advantage: you get to camp in the airline lounge and get some work done that you have been too tired/jetlagged to deal with. I am in the United Red Carpet Lounge. It is 18:33 PDT, and my flight boards at 22:00 PDT. I have been here since 15:00 PDT. I have caught up with a client project, completed my (dreaded) weekly timesheet, booked accommodation for my Columbus, OH trip, and tidied up an analysis script that I use to process client measurement data. Seems odd that this is the most productive time of the week. This trip is a 48-hour turnaround from Boston to LA to finish up the project for a large client. The first half was handled by some colleagues, and was detailed here. Then,when I get home, I have to go to NYC (Long Island City actually) for the day on Monday. And, as I mentioned above, Columbus which is set for the middle of the month. Compared to some jet-setters out there, this is nothing. But I travelled so much between August 15 and November 15 that I went from 2,000 miles on United to well into Premier (24,000+ miles). This trip makes the fourth cross-country trip in 2.5 months. Not bad for a homebody. I have three more hours. Think I will sit back and watch Trois Couleurs: Blanc.